Webster defines Spectrum as a "series of radiations arranged in regular order" or a "continuous sequence or wide range". This could not be a more appropriate description of the award-winning group Spectrum, which draws upon the talent of four radiant voices and diverse personalities to form a first class vocal quartet. 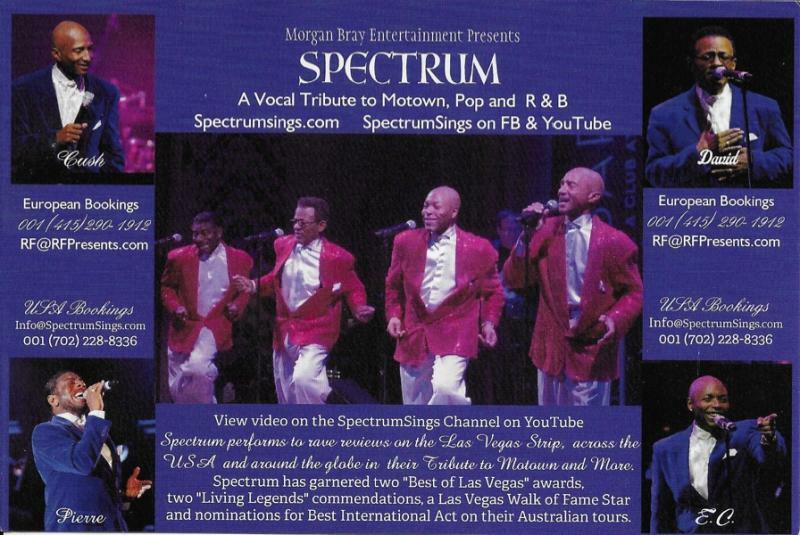 After spending six stellar years recreating the sound and style of the Four Tops in Las Vegas' multi-million dollar production shows American Superstars and Legends In Concert, the group has developed the versatility to credibly cover the music of groups from the Platters to the Temptations to Boyz 2 Men. It is this versatility that has propelled them to the status of headlining their own shows in which they perform stirring renditions of the all the best cover tunes. Contact Robert Friedman at rf@rfpresents.com or 415.290.1912 for international booking details.